In 10-inch skillet, cook sausage until thoroughly cooked and no longer pink, stirring frequently; drain. Stir in onion, parsley, basil, oregano, garlic, pepper and tomato paste; cook 5 minutes, stirring occasionally, until hot. Meanwhile, heat oven to 375°F. In small bowl, mix Parmesan and cottage cheeses; blend well. Unroll dough into long rectangles on ungreased cookie sheet. Firmly press edges and perforations to seal. 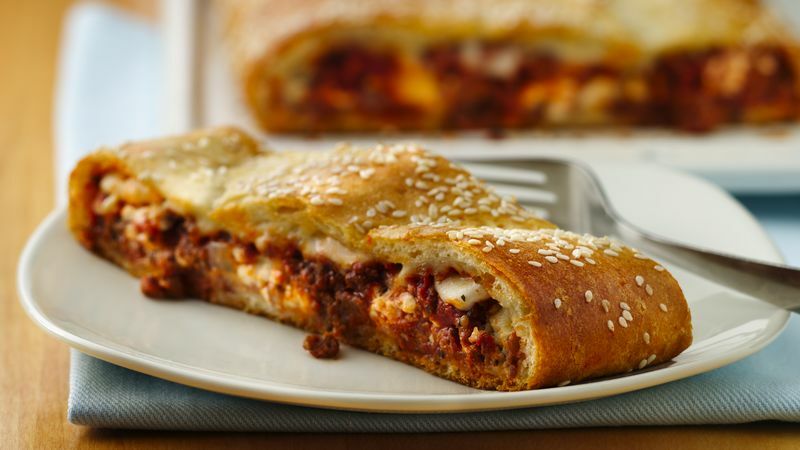 Spoon half of meat filling in 3-inch wide strip lengthwise down center of dough to within 1 inch of short sides. Spoon cheese mixture over meat filling; spoon remaining meat filling evenly over cheese filling. Sprinkle mozzarella cheese over filling.